Yes, you can "under" lap the tin from the bottom. My brother just finished a patch job on one of our barns where he had to cut off Approx 8 ft of tin at the bottom and go under the old with the new. I would also recommend using a washer-head screw like this: (http://www.idealtruevalue.com/servlet/the-63227/Detail). I just used them on a chicken coop and they worked great. That's the kind of screw we used on the roof of the East Wing, and they worked very well (although expensive.) Glad to hear we won't have to replace the middle section of the tin! Have you considered selling the barn wood? I think it's a pretty hot commodity. You might even be able to have someone dismantle it in exchange for keeping a portion of it while selling the remainder and making enough to build a new metal barn. Ruthylynn --- I think we're going to go with our locally owned hardware store to source the tin, partly just to help him out, but also partly because we need to match the same kind of tin currently on the roof or we'd have to replace the whole thing rather than just two thirds of it. From their website, White Industries seems to specialize in more modern house tin rather than the old-fashioned barn tin. Thanks for the suggestion, though! Eric --- I've only barely saved up enough to replace the roof --- it would probably take until the barn fell down to save enough to make a solar roof. I figure collecting rainwater off of it would make the project increase our self-sufficiency at least a bit and would work as a much cheaper alternative to solar roofing. Sarah --- I was actually pondering selling the wood instead of fixing the barn, but when I looked into it, it sounded like we'd only get about $1,000 for all of the wood, and that's if we took it apart ourselves. I don't think all of the time required to deconstruct the barn would be worth it! Now, if someone was willing to take the barn apart themselves and give us enough money to build a smaller, more manageable structure, then I'd be interested. I just had a metal roof put on our little cabin in PEI (Canada), 650 sq. ft. It was a simple job, pitch of about 3 to 4 and was a shed roof (like half a roof). It was ordered in squares (or 100 sq. feet) and the metal cost $100/square (though I think everything in Canada is much more expensive). This is probably the "house" metal roofing though (it was colored). The labour was $900 for 3 guys and it took less than a day, but it was an easy roof and all the roof was done. That was pretty cheap for labour. Where I live (West) it would have probably been 3x. They used screws with rubber washers so it won't leak. It is my understanding that the metal company cuts the roofing panels to the size required (custom) so all roofs/panels are different. Maybe you could ask locals/neighbors who they use. That's what I did as I did not know anyone there and I was a gal by myself and everything went very well. Also, my local Home Hardware had a list of reliable contractors in the area and that's where I found the roofers. I would highly recommend the rain barrels. Nothing like soft rain and it's free. I'm with you about the heights. If you figure out the pitch of your roof (search Google) there should be some easy instructions on there for doing the math for what you will need. Best of luck with the project. Make sure that the wooden structure is OK. If part of the frame is has decayed, it might not be worth it putting a new roof on. If you want to work on the roof yourself, wear a safety harness. If you are working on one side of the roof, throw the line over the roof and fasten it on the other side on a pulley with a brake so you can lower the person down gently in case of a fall. Get a line that stretches a bit so it breaks falls somewhat gently, or get a line with a shock absorber. Don't know about the US, but over here a contractor would be legally required to perform work on that height from a cradle elevator. In your case you'd probably need one on tracks to even reach the place. The person you are buying the material from will probably know of some people that may be willing. I'd keep trying anyone you can find but make sure they are insured incase there is an accident you don't want them to sue you. Heather --- Thanks so much for sharing! It sounds like the price of your tin is right in line with what I've priced our barn tin at --- the 8 foot by 2 foot panels you can buy at Lowes, for example, are $16.50 apiece. If the labor's in the same ballpark, it sounds like we might should plan on spending around $2,300 on the labor. Roland --- Excellent point about the structure. I'd been assuming that since the ridgeline was okay (it's under the good tin), everything else is mendable, but maybe we should find a way to get someone to really check it out before buying the tin. Brian --- The bonus of collecting rainwater is that we don't have to pump it, which saves energy and money (although not all that much.) I figured I'd probably use the rainwater for things that don't need much pressure, maybe moving my wringer washer over there, finally setting up the drip lines to irrigate our berries, etc. But even if we just channeled the water to a designated wetland area or something, it would be a bonus! Just my two cents worth. Go ahead,keep the change. Around here I can purchase metal cut to length. It does not come in standard lengths of say 8' or 12'. You order it in one inch increments. Just make sure the corrugated rib pattern matches your existing metal or tucking it under the old metal will be impossible. 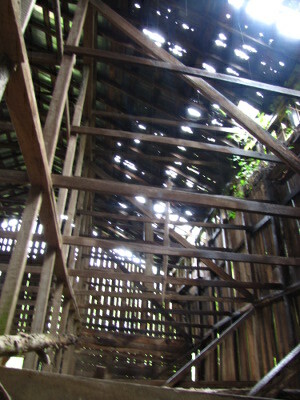 As for selling the barn, tobacco barns are good for lumber reuse. 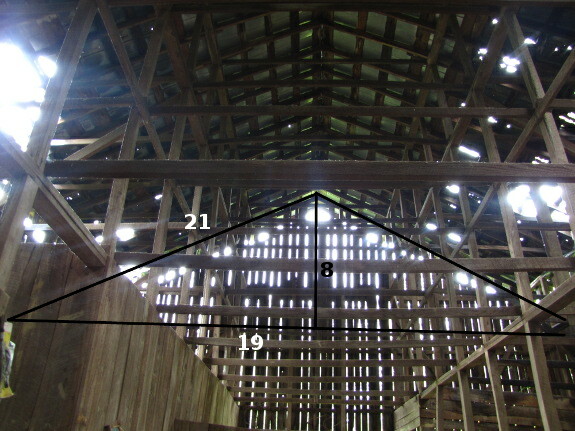 Dairy barns have so much white washed lumber in them and tobacco shed do not, so that increases the value some. The trouble with selling your barn is access. They will need to bring in a crew of men and equipment and trailers to haul it all in and out. But the barn dismantling crews bring up an other idea I had. 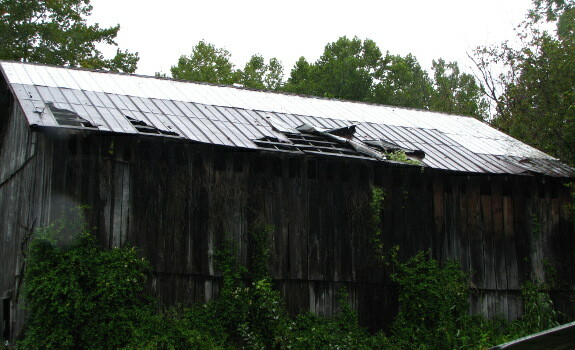 I am planning on asking a barn salvage company about buying used metal roofing from them. I would assume they must save metal roofs as well as lumber and timbers. Maybe you could find some salvaged metal and save a few bucks. You still need someone to install it though, and the installer will grumble about salvaged tin. Proceed with caution! I'm a contractor up here in New England. Their are alot of old barns up here - they can be very expensive to save once they get past a certain point of deterioration. 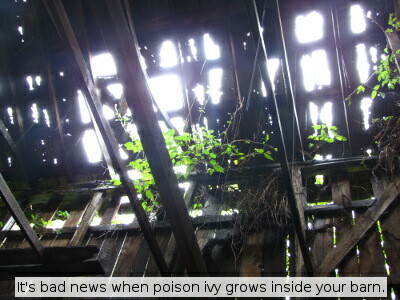 From your pictures it is hard to tell how far gone it is, like you said poison ivy inside is not a good sign. I would just hate to see you send reinforcements to a losing battle. Are there any Amish or Mennonite communities in your area? They do quality work at very reasonable prices. Justin --- Good point that lack of access would make it much tougher to sell the barn wood. We actually have some free tin from Mark's mom (Thanks, Rose Nell!) but the V-pattern is wrong, so we'll need to use it with new construction. Bill --- I'm always so glad to hear from an expert. Sounds like we really do need to get someone out here to look at the structure before we buy the tin. Debbi --- No local Amish, but there are some Mennonites about an hour and a half away. That might be too far, but you've got a great point that they're just the type of labor pool we should tap into.